After photos of Fitzgerald started making rounds online, 12 News received viewer complaints that the photos were fake and being used for a political agenda. So we asked the Arizona Cardinals. 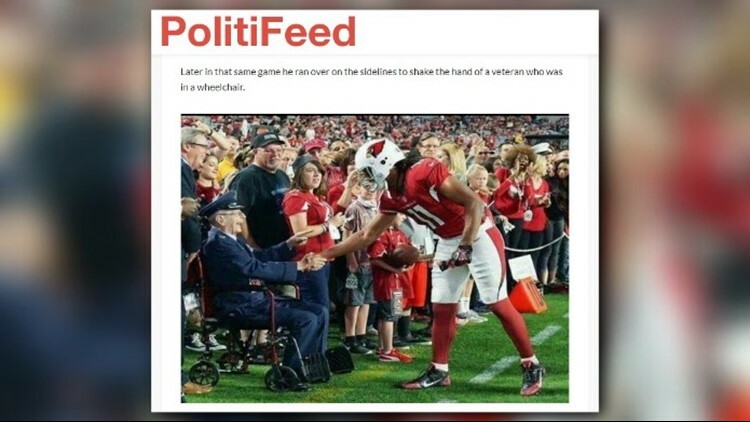 PHOENIX — The Arizona Cardinals are responding to the validity of some photos showing Larry Fitzgerald's respect for the military after a conservative blog shared them in an article. The pictures in question appeared inside a June PolitiFeed article headlined, "NFL Player Rushes Field During National Anthem, Stuns The Crowd When He Reaches Out And Grabs An Airman’s Hat." One photo shows Fitzgerald placing an Airman out when his hat fell off and the other shows a photo of Fitzgerald shaking hands with a veteran. The photos are low quality and the author of the article says both photos were taken during the same game, but Fitzgerald is wearing different jerseys. While the article was published months ago, it was posted to the blog's Facebook page on earlier this week, garnering thousands of shares. After the article and photos started making the rounds, 12 News received viewer complaints that the photos were fake and being used for a political agenda. 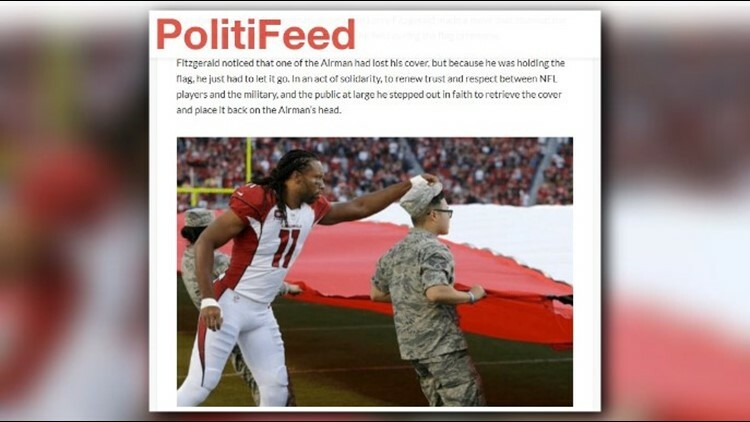 Pictures of Larry Fitzgerald are in question appeared inside a June PolitiFeed article headlined, "NFL Player Rushes Field During National Anthem, Stuns The Crowd When He Reaches Out And Grabs An Airman's Hat." Photos of Larry Fitzgerald shared in a Politifeed article have Cardinals fans asking if they are fake news. The photos are low quality and the article says both photos were taken during the same game, but Fitzgerald is wearing different jerseys. In today’s NFL climate, where Colin Kaepernick’s Nike commercial is causing controversy and many players are following his lead by taking a knee during the national anthem, many people are wondering if the pictures are legit for several reasons: The article was originally posted on June 22. The picture appears to be altered. Lastly, would Fitzgerald really be allowed to run onto the field during a national anthem? We contacted the Arizona Cardinals to find out the facts behind the photos. Mark Dalton, senior vice president of media relations with the team, says the pictures are, in fact, real. Dalton sent 12 News a picture from his own Twitter page when Fitzgerald shook hands with Col. James Ballard before a game during the 2015 season. Dalton also confirmed the legitimacy of the picture of Fitzgerald helping an airman. He says it happened in San Francisco two years ago and that Fitzgerald put the man's hat back on when it had blown off during the national anthem ceremony. Why PolitiFeed decided to release the article on social media four months after its original release is something we don’t know, but one thing's for sure: Fitzgerald is getting a lot of praise for his actions— even if those events didn't happen this past Sunday. 12 News reached out to PolitiFeed but has not received an answer.